As Germany moves to phase out coal power, more focus is being placed on relying on wind energy to fill in the gap. According to the German BWE wind energy group, 29,900 wind turbines are currently operating in the country with a total capcity of 56,000 megawatts. Wind energy makes up 18.8% of the country’s power supply. But the Handelsblatt reports there are “glaring weaknesses” and that wind turbines cannot be relied on to deliver steady power when it’s needed. VGB Director Oliver Then says that as more and more green energies get fed in, the less gas and fossil fuels plants operate, and thus making them no longer profitable. Yet they remain absolutely essential to keep the grid stable. Can rely on neighboring countries? Proponents of green energies who support a rapid fossil fuel phaseout insist that it can be done, and that Germany would only need to rely increasingly on a power supply from neighboring countries. When the wind is not blowing in Germany, power could be imported from another country where the wind is blowing. This means that if wind lacks in Germany, it often lacks in Poland as well and so neighbors cannot be relied on to provide electricity. Pump storage as a way to store energy is also not feasible says Then, saying it would need to be increased 1000 fold, which would entail enormous costs. Then notes that periods of no wind extending two weeks are not uncommon in Germany. We have seen from data from one of the forum regulars that German wind is really one of the most ineffective ways of creating electricity. And for 80% of the time it is operating at less than 30% of nameplate. It really is a “why bother” form of electricity production that requires “old reliable” from somewhere to fill in the HUGE gaps in supply. Why bother? Because it greatly reduces the usage of fossil fuels. And regardings backup, those fossil fuel power generators already exist. It is not like Germany would have to build up extra capacity to back up increasing numbers of wind turbines. While it would be wise to switch such a backup to natural gas instead of coal, it’s what we have right now. 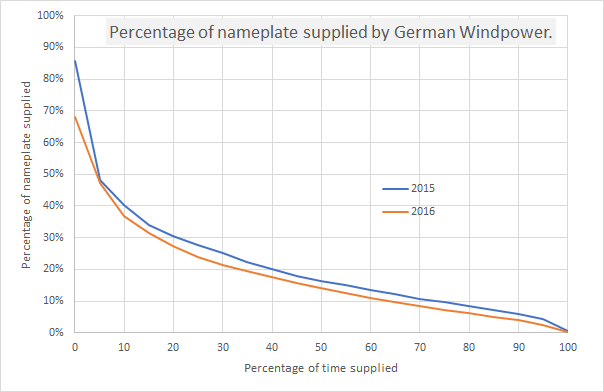 If you would want to achieve backup with storage Germany would need around 5000 GWh to cover the dark days without wind for the entire year. Part of that could be batteries (short term) and the rest would probably be natural gas generators for the time being. One troubling implication of that density reversal, Smil notes, is that in a future powered by renewable energy, society might have to devote 100 or even 1000 times more land area to energy production than today. That shift, he says, could have enormous negative impacts on agriculture, biodiversity, and environmental quality. In contrast, wind turbines work on average only about 23 percent of the time, which means that even with all the requisite new high-voltage interconnections, slightly more than two units of wind-generating capacity would be needed to replace a unit in coal, gas, oil, and nuclear plants. If 10% of the US electricity generated in 2009 (395 TWh or 45 GW) were to be produced by large wind farms their area would have to cover at least 22,500 km2, roughly the size of New Hampshire. To see other difficulties associated with that transition, Smil says, look no further than Germany. In 2000, fossil fuels provided 84% of Germany’s energy. Then the country embarked on a historic campaign, building 90 gigawatts of renewable power capacity, enough to match its existing electricity generation. 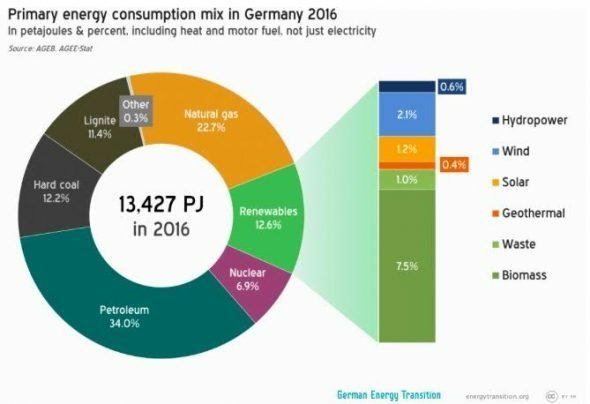 But because Germany sees the sun only 10% of the time, the country is as hooked as ever on fossil fuels: In 2017, they still supplied 80% of its energy. “True German engineering,” Smil says dryly. The nation doubled its hypothetical capacity to create electricity but has gotten minimal environmental benefit. Solar can work great, Smil says, but is best where the sun shines a great deal. For a 5-megawatt turbine, the steel alone averages 150 metric tons for the reinforced concrete foundations, 250 metric tons for the rotor hubs and nacelles (which house the gearbox and generator), and 500 metric tons for the towers. If wind-generated electricity were to supply 25 percent of global demand by 2030 (forecast to reach about 30 petawatt‑hours), then even with a high average capacity factor of 35 percent, the aggregate installed wind power of about 2.5 terawatts would require roughly 450 million metric tons of steel. And that’s without counting the metal for towers, wires, and transformers for the new high-voltage transmission links that would be needed to connect it all to the grid. I hope you are not looking only at what this one guy has to say, max. Increasing the installed wind power in Germany by a factor of 100 as suggested by your quote would cover the power consumption of Germany and many of its neighbors completely with wind. So lets assume these numbers are correct. 600 mega tonnes of coal for 30 petawatthours for 20 years (I am assuming those wind turbines will not be decommissioned after just one year). According to this website (http://extraconversion.com/energy/terawatthours/terawatthours-to-tonnes-of-coal-equivalent.html) 600.000 TWh equal 73.701 million tonnes of coal. So using wind turbines is at least 123 times more efficient on coal usage as just burning it to produce eletricity … mind you, I didn’t include any efficiency losses from converting coal to eletricity. So, I really hope you have other sources than this guy to inform you view of the state of power/electricity generation. yes it always comes to the question who are you going to believe. when I was young they teach me Tito is best, Communist party of Yugoslavia is best and Socialist Federal Republic of Yugoslavia best. Great reduces nothing .. certainly not your BS. You are only an expert in your own mind. You have shown your knowledge of science, maths, physics etc is tenuous to say the least. No but they have to maintain them, and hope their electricity back-up can continue from neighbouring countries coal and nuclear. No wonder the cost of electricity is SO HIGH in Germany !! Oh please … just go back into your fantasy world thing. Answered the question already? What is the problem with that? Wouldn’t need more gas than we are burning today and the storage network for gas already exists (around 200 TWh). And with the needed overcapacity one can ineffciently produce methane when all battery storage facilities are full and use that to fill up the gas storage network. Everything needs maintenance and it’s called “Verbundnetz” for a reason. Besides, Germany is exporting way more electricity than it imports. It’s high because of taxes and included subsidies for expensive older installations that we agreed to pay to the owners for 20 years to accelerate the advent of sustainable energy/electricity generation. Even you should have heard by now that the LCOE for renewables quickly came down and is now even competetive with new coal. Need I really provide a link for that information and play your internet butler for this? So you ADMIT the high cost of German electricity is down to the subsidisation of an unreliable, erratic electricity supply. You are almost certainly aware the the subsidies are now just in a different form, like payments regardless of production, feed-in mandates, graft and other corruptions. The compositions of the Germany electricity price is no secret, spike55. The price increased by roughly 80% since 2000. Half of the increase is inflation, the other half increased taxes/subsidies included in the price. Oh, you mean like the subsidies fossil fuel industries receive? Of course we should not forget the hidden costs as well. I am betting I am paying much less for electricity as the average US citizen. How much do you pay per month, spike55? How much electricity do you use per year? Just so you know, I don’t love to pay high prices for stuff. But calling our electricity prices high is ridiculous. Electricity is still cheap as f*** even at 30 ct/kWh for residential use or whatever low price the industrial one currently is. By this comment it is clear that you recognise the only benefit of installing wind generators is to reduce the direct consumption of fossil or nuclear fuel by dispatchable generators. There is no reduction in capital for the other generators and maintenance costs increase because the dispatchable plant is going up and down with the inverse of the wind generators. The wind generators need three to four times the capacity to produce the same output as dispatchable generators. This comes at huge cost in energy (and CO2 emissions) to build them and the land they occupy. The linked paper takes a realistic view of the power density achieved by wind farms in the USA. A not so surprising finding is that the power density is falling as the size of the farms increase due to interference between generators. Power density on the large farms is no below 0.5W/sq.m. To put that figure in perspective, Germany would need to cover half the entire country with wind generators to meet the average power demand from wind. That is a big commitment for less than zero benefit. Another interesting finding is that the mixing caused by wind generators increase the ground temperature so they actually contribute to Global Warming as measured by ground based instruments. By this comment it is clear that you recognise the only benefit of installing wind generators is to reduce the direct consumption of fossil or nuclear fuel by dispatchable generators. That is the current effect of adding a wind turbine to the grid, yes. There is no reduction in capital for the other generators and maintenance costs increase because the dispatchable plant is going up and down with the inverse of the wind generators. Do you think capital is the major cost of a fossil fuel power plant? Do you think having a fossil fuel power plant as backup is more expensive than storage? There are very few power plants that go up and down. It’s not like the generation of electricity by wind in a nation wide grid changes suddenly. It behaves very predictable, solar too. So? Does it cost more energy in the form of burned fossil fuel to get the same amount of TWh from a wind turbine instead a fossil fuel power plant? Yes or no? We aren’t going to be able to not consume energy or use part of the energy to get useable energy. The point is minimizing our impact, not acting like we don’t exist. To put that figure in perspective, Germany would need to cover half the entire country with wind generators to meet the average power demand from wind. That is a big commitment for less than zero benefit. On the other hand we only need to cover all the area that we covered with asphalt (around 5%) with solar cells and could power Germany from only that. And here I thought skeptics would not trust models … but sounds plausible, everything until “for less than zero benefit”. and less that 30% of its nameplate for 80% of the time. Solar on the other hand is much more reliable. It produces ZERO PERCENT of its nameplate for at least half the time. …Why bother? Because it greatly reduces the usage of fossil fuels…..
Why is that a good idea? Fossil fuels are a good way to run the energy supply of a country – they are plentiful and we have good technology for using them. Why is that obvious to you? Who tells you to believe such a thing? Yes, by using them in the most efficient and sustainable manner possible. There is ZERO EVIDENCE that there is. Anything is just a FANTASY. Have you got any EVIDENCE ze-seb? Or just your normal EMPTY bluster and rhetoric. THE FACTS. Try LEARNING them for once. They are totally self-evident unless YOU are in complete DENIAL. Are the saying the LIA didn’t exist and wasn’t a COLD ANOMALY? REALLY? !!! Coal is a FAR more EFFICIENT and RELIABLE resource than wind and solar can EVER be. To be anti-CO2 is to be ANTI-LIFE. Is that how you are, ze-seb !! Why do you think this was trolling? Because its your ONLY purpose here. You have shown you have no intention of presenting ANY science to back up your manic belief in CO2 warming. You are just where to disrupt rational discussion. I would MUCH rather take note of what Vaclav Smil says than a lowly, uneducated computer software programmer with basically zero knowledge of climate or physics. There is absolutely ZERO need for Germany to put itself through the agony of wind and solar UNRELIABILITY. Do we need to go through that troll list from a few days ago again? You are not even trying to not check all the points on that list. Nope, that is what you guys do. One comment of mine causes dozens of comments from you guys calling me a troll, evidence free or whatever creative insult is en vogue today. It is very rare that I get a constructive reply, from you specificially it never happened as far as I can remember. Well, it’s a good thing nobody really cares what you take note of. We already know that you are just trying to troll opponents away in your unmistakeable charming way. Yet another evidence free rant. You come here PURELY to disrupt and rant..
You are a perfect match for that list the other day.. but so arrogantly self-deluded you don’t even see it. You have NEVER made a constructive reply to anything.. that is not in your agenda of disruption. So FUNNY to see you using the “t” word when you KNOW that is your sole purpose here. I hope Pierre chops it. That would be funny to see your reaction, poor sensitive little ze-seb. Seems I REALLY hit a sensitive SJW nerve when I gave you the FACT that NOBODY could care less what you and your degenerate ilk think and that your comments here is a TOTALY WASTE OF SPACE. You have NEVER been able to back up anything with science, and EVERYBODY knows you as NOTHING BUT AN EMPTY VASSAL. You have ZERO standing when it comes to anything. An EMPTY waste of space. Your comments are worth LESS than the smelly stuff that sometimes gets on the bottom of a shoe. SO sad.. So pathetically ze-seb. I would MUCH rather take note of what Vaclav Smil says than a lowly, uneducated computer software programmer with basically zero knowledge of climate or physics. That’s YOU I’m talking about, ze-seb. And I can be 100% sure that everyone else here, or on any other rationally thinking blog, would do the same. Your posts are MEANINGLESS and IRRELEVANT. They contain ZERO science or EVIDENCE. They are just mindless space fillers. That really is a WHY BOTHER electricity supply system. Needs basically a 100% back-up available at all times. Having one UNRELIABLE system and a secondary 100% backup. Always going to be very costly, as Germans are mostly well aware. Yeah sure, if you completely ignore what burning fossil does then of course you would come to such a conclusion. Fortunately the rest of the world doesn’t agree with people like you that try to make it a partisan issue to get more support (I am guessing you hope that this way more right-leaning people will automatically support your cause). What does it do apart from provide highly RELIABLE, CHEAP power that has built the civilised world.? There is NO EVIDENCE of any other issue except enhanced plant growth and crop yields. Wind and solar are way more harmful to the environment than modern coal is. Why build one erratic and unreliable system parallel to a perfectly good 100% reliable system, for basically zero effect except increased electricity prices. Then mandate that the erratic, unreliable system has to be used first, forcing the reliable system to operate in a highly inefficient manner. Its just totally and bizarrely IRRATIONAL. Right down your alley !! You earn a big long *sigh* for that reply. What was that about the evidence free ranting you are talking about? Are you sure only leftist Democrats are accusing others of what they do themselves? Sure you weren’t talking about yourself? Unsustainable, causes climate change, unhealthy, inefficient use of the resource. Does that mean you acknowledge that burning fossil fuel caused the CO2 increase now? You usually reply with this nonsense to increased CO2 concentration threads, but now you replied to burning fossil fuel. Change of mind? Congratulations. The adjectives make or break sentences like this one. I know you like to make some of them stick by constantly repeating them, but no … we are not building up an erratice and unrealiable system and the system we have is not perfectly good 100% reliable. Also, the effect targeted is not increased electricity prices. Just another rant from you. Ouch, I am really hurt in my basement, divorced from reality … in my ghetto alley. What kind of person are you that you feel the need to post comments like these? Yep, about 15% of it. And of great benefit to the planet it is. You have given no evidence other than misguided dumb anti-calculations, that actually prove my point that human CO2 one is a small part of the rise, mostly being absorbed within the local area..
“Unsustainable, causes climate change, unhealthy, inefficient use of the resource. You have drifted off into your LIES and your FANTASIES from la-la-land, and your scientifically unsupportable garbage about CO2 and climate, as you always do. To say that wind and solar are NOT erratic and unreliable is the very height of DELUSIONAL idiocy. Great for world plant life. ZERO EFFECT on global climate. Just wish our politician weren’t so taking in by the Anti-CO2, anti-life AGW agenda, and they would wake up and start rebuilding the RELIABLE electricity supply systems. That’s been touched on before. Here’s one reference on the problem with the assumption that the wind is always blowing somewhere. Apart from the phenomenal expense of batteries, one would have to not only generate enough power for consumers, but also enough additional power to charge batteries for a shortfall. But if one hasn’t enough for consumers, there will certainly not be enough to charge the batteries that one can’t afford to make and replace, anyway. Add in the rest of the problems which are not amenable to engineering solutions, and one should get some idea of the magnitude of the problem. Not a reliable source of information. But yes, it happens that wind is not blowing and it’s dark at the same time. There are many types of storage and they would be used to cover timespans where wind+solar+other renewables can’t cover the demand. A $200 5000 cycles battery costs 4 cent per kWh that went through it. It’s expected to go down to $100 and even more cycles in the coming years. Until large scale battery storage becomes necessary they will be cheap enough. They will also be perfect for keeping the frequency of the power grid super stable in early applications. The “high” cost in those applications should competetive already. one would have to not only generate enough power for consumers, but also enough additional power to charge batteries for a shortfall. Kind of obvious, don’t you think? If the yearly demand is 500 TWh you need to produce that amount of electricity. Since you have capacity factors lower than 100% you’ll inevitably get days with overproduction that goes to storage and you’ll also get days (or nights) where power needs to be drawn from storage. But if one hasn’t enough for consumers, there will certainly not be enough to charge the batteries that one can’t afford to make and replace, anyway. The only problem I see is whether or not it will become economical to use storage. The price decreases in wind, solar and battery technology indicate we will reach that point pretty soon. For long term storage systems like power2gas I am not so sure if just importing gas and turning of power generation once all batteries (and/or pumped storage and/or other short term storages) are full, will ultimately cost less. Maybe industries will develop, that specialize on using the excess power in those instances. Who knows. Who knows.. Ie ze-seb has zero clue. Just this wild-a** fantasy devoid of any engineering common-sense or comprehension. Fantasies into never-never-land. Coal maintaining its share of energy use, even the huge destruction of the German landscape and environment by wind turbines, has made very little difference to Germany’s CO2 emission, and even if it did, it would have ZERO effect in reducing AGW, because AGW is a myth. All that PAIN and habitat destruction, all on a fabricated socialist fantasy, with ZERO gain for anyone except the subsidy swillers. So our troll is a self-described software “expert”. I have this picture of a social inadequate, living with his mother and playing with his computer, in the basement, totally divorced from reality. That part has been proven MANY times over. !! And he is most certainly socially inadequate and mentally naïve. To go along with his pseudo-learning of science, physics, maths etc. He tries to hide it all with continual irrational bluster and in-your-face arrogance, because its all he knows. B&T, I am using the term “software expert” because you guys are using it for Tony Heller. I could also call myself a “veteran software engineer” if you prefer that? Normally I wouldn’t grace a troll’s rant with a reply. But just to put the record straight. First degree and PhD (Natural Sciences) from Cambridge, where I still work as an academic. About 40 peer-reviewed papers. So I actually do know about science and the scientific method. And most of what passes for climate “science” is not. Even the most basic tenet of the AGW farce is a load of scientifically unsupportable bulldust. Well then, this should make you be able to add to any discussion. Why is everything we can read from you only the usual “do not feed the troll” with zero substance? Do you think what is passed on here as science is “science”? Or are you just not intervening by anything but the mentioned troll feeding thing because you would not be able to defend those claims that get made here? Whatever work you pretend to do is a tiny dot compared to TH’s accomplishments and knowledge. Everything he puts forward is solidly support by FACTS and DATA.. you should try it some day !! Your pathetic child-like JEALOUSLY is shining through. Coal is stored energy that is used by controlled burn to extract usable energy. A natural battery ready to dispense what it has to do the most good, humans found a way to do it so it could become usable energy. Can’t really argue with what works the best of all. In the early years, shotguns were used to blast the build up of coal residues that stuck to the boiler. The shotguns ended up with severely bent barrels, they were used so much. A la nina weather pattern has developed this Fall and it is quite cold, 49 degrees Fahrenheit below the record high which occurred in 1942. Not record cold, but close. According to a “Gutachten des wissenschaftlichen Dienstes des Bundestags” France experienced 57.6 minutes of blackouts per customer in 2015 and 52.6 minutes in 2016. Please compare this to the super “unreliable, erratic” power grid of Germany where customers experienced only 15.6 minutes of blackouts in 2015 and 13.3 minutes in 2016. Belgium is also above 20 minutes. I have a feeling the concern for German power grid reliability you guys are displaying is – how did Bitter&twisted put it? – “totally divorced from reality”. REALITY CALLING, WILL YOU ACCEPT THE CHARGES? Ehm, that is the reason, not wind turbines “poor capacity”. From the first sentence of Pierre’s article, “As Germany moves to phase out coal power, more focus is being placed on relying on wind energy to fill in the gap.”, we see her poised to repeat India’s negative experience. What should have been a warning is instead a portent of Germany’s dark future, if she persists in her Energiewende folly.